C.G creates the world of Kheris and the early life of one of her core characters as vividly as the universe she has created in the thief guild novels. It is no easy task to write a book which is in effect YA fiction when you normally write novels aimed at an adult or mainstream audience. 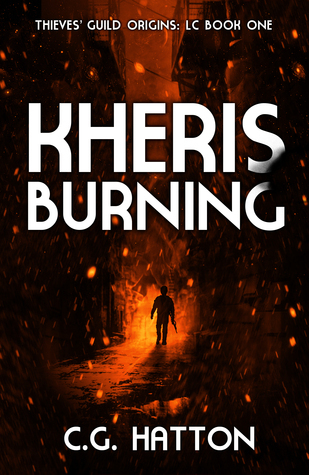 Not that I would not recommend the Thieves Guild series to YA readers, I would recommend them to anyone, but as a starting point for a YA reader, Kheris Burning is wonderful. But more than that C.G. pulls off a trick which the best YA fiction, and indeed the best fiction, in general, aspires to achieve. Wrapped up in a story of adventure, of the coming of age and struggling against impossible odds is a vision of a life more complex. An ingrained truth and insight into the human condition. Yes this is SFI, but like all great SFI it tells us something of the real world and the experience of those who live within it. This is a story of a street kid, in a war-torn land, trying to survive while been pulled by both the oppressors and the oppressed. The forces of the empire and the forces of the rebellion. The occupying army and the freedom fighters, and used by both. The street kids are seen as recruits in waiting for the rebels who’s goals are never so much about the freedom of the people, but who wields power over them. Yes its SFI, but it could be Syria or Lebanon or Baghdad. What on one level is an adventure story, is on another is a truth of the disenfranchised trying to survive in their bombed out cities. Knowing neither side is on their side and trying to get what little they can from each. It is a world that is, sadly, grounded in reality. Though the novel is written with the lightest of touches so you only realise these facts when you put the novel down a moment and think upon it. And that is the trick. While you read C.G’s novel you learn a little of the realities of dispossessed because she realises it within the world she creates. In short, as I have failed to be, read it. Enjoy it (and you will) and take from it what you will. It is both a joyously fun read, and a window into the darkest corners of the real world because it is so well written.